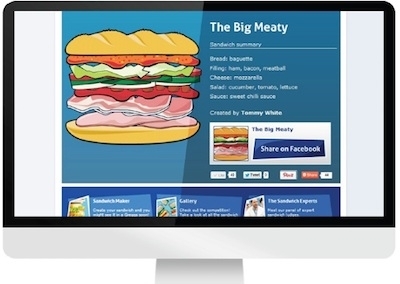 A ‘Sandwich Maker’ app on Facebook, which almost 8,000 people used to create a new sandwich for High Street retailer Greggs, has won a gold award for ‘Best Use of Digital in Retail’ at the Digital Impact Awards. The campaign, created by digital marketing agency STEEL London, offered the chance for one lucky winner to have their sandwich made and sold in Greggs shops. Over 7,800 people entered using the app on Gregg’s Facebook page, spending a total of nearly 476 hours on the site. The campaign also resulted in over 62,000 new Facebook fans for Greggs and achieved 20,000 more impressions per Facebook post than for normal non-campaign posts. Neil Knowles, Greggs digital brand manager, stated: “It was a brilliantly simple campaign that delivered beyond our expectations, particularly in terms of the dwell time and the big uplift in the number of Facebook impressions – 20,000 more than we usually get per post. At the end of it we also got a rather tasty 'crowd-sourced' sandwich that our customers had the opportunity to enjoy." Created by Tommy White, the winning sandwich was called “The Big Meaty” – a baguette containing ham, bacon, meatballs, mozzarella, cucumber, tomato, lettuce and sweet chilli sauce.